HR is no stranger to data and metrics and the most progressive of leaders in this space are now leveraging robust and holistic workforce analytics for powerful results – for their organizations and for themselves. To be progressive and innovative, HR leaders are situating workforce analytics within the context of business objectives and outcomes. Long gone are the days where HR leaders focused on processes or activities alone - today, innovative HR leaders are more focused on strategy and value - and that comes in many forms. And therein lies both the conundrum and the opportunity - how an HR team, traditionally viewed as worried about back-office, cost-centre process metrics, can suddenly be talking about metrics with meaty-business value. HR teams must gain credibility, relevance and business-partner status by connecting people performance to business performance - across the outcomes which are of most important to your Board, CEO and Executive team (such as costs, revenue, margin, customer churn, productivity, sales quotas achieved, etc.). From our perspective, analytics in and of itself is just numbers. And we know that this level of understanding is not actionable nor is it one that Executives get excited about. 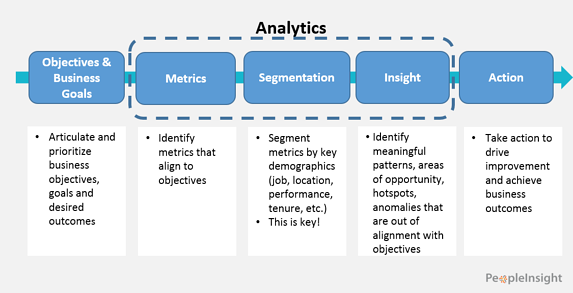 The real power comes from aligning analytics with objectives in order to achieve meaningful outcomes for the business. To make your HR metrics and analytics actionable and to raise the attention of the Executive table, here's what you should do - you must situate analytics within a broader context flanked by business objectives at the one end, and business outcomes at the other. Step 5 - Take Action - take action to drive continuous improvement in your program areas such as learning, onboarding, recruitment, manager capabilities so that you can accelerate delivery of your business outcomes. While reporting that you've trained 43% of the National Sales staff to date will likely get you some nodding heads from a small slice of your Executive colleagues, a preferred alternative would be to flip this activity-based metric into value driven insight. How about HR insightfully presenting the facts about Pacific Sales, who ensured 4 out of 5 of their Sales team attended the first round of training, and have exceeded their quota by 28% since that training? Now that's a conversation starter. Looking at an activity metric from a value-driven lens will raise HR's profile and credibility as a business partner and value creator. And when you start connecting the dots about how your programs directly create business value, you’ll start to really make a difference. To learn more about leveraging analytics to create value, download our eBook: Workforce Analytics for Human Resources.